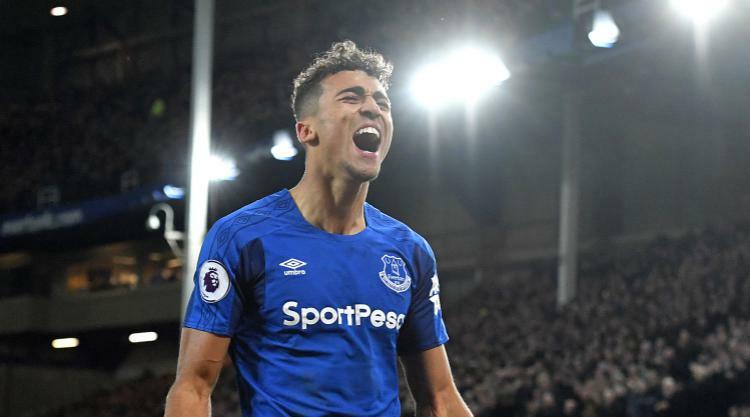 Everton forward Dominic Calvert-Lewin has signed a new long-term deal with the Premier League club. The 20-year-old, who arrived at Goodison Park from Sheffield United in August 2016, will remain with the Toffees until June 2023. Calvert-Lewin has formed an impressive partnership with Wayne Rooney in attack this season, scoring six goals across 28 appearances in all competitions. Everton boss Sam Allardyce told the club's official website: "Dominic Calvert-Lewin is a really exciting talent, he's improving all the time and he has the athleticism and attributes to become a top player in his position. "Working so closely with a player like Wayne Rooney can't fail to help him in the role he plays in the team." Fellow youngsters Jonjoe Kenny and Mason Holgate have also committed their futures to Everton, keeping them on Merseyside until June 2022. Kenny, 20, was the Toffees' under-23s skipper last season and has made his first-team breakthrough this term. "I've made the point before that Jonjoe's decision-making for such a young man is very impressive and part of the reason he makes the game look simple," Allardyce said. "He is also an excellent defender, very grounded as an individual and he has an innate desire to succeed. "He's hungry and his choice of ball possession is first class for a young man. He is an outstanding young man at full-back." Holgate made his Premier League debut on the opening day of last season after joining the club from Barnsley in August 2015. "For me, Mason Holgate's potential is becoming a reality," Allardyce added. "He has set his standards in these past number of games he's been involved in and it's a matter of him maintaining those standards, continuing to work hard on his game and then he can become a really top player in the Premier League."